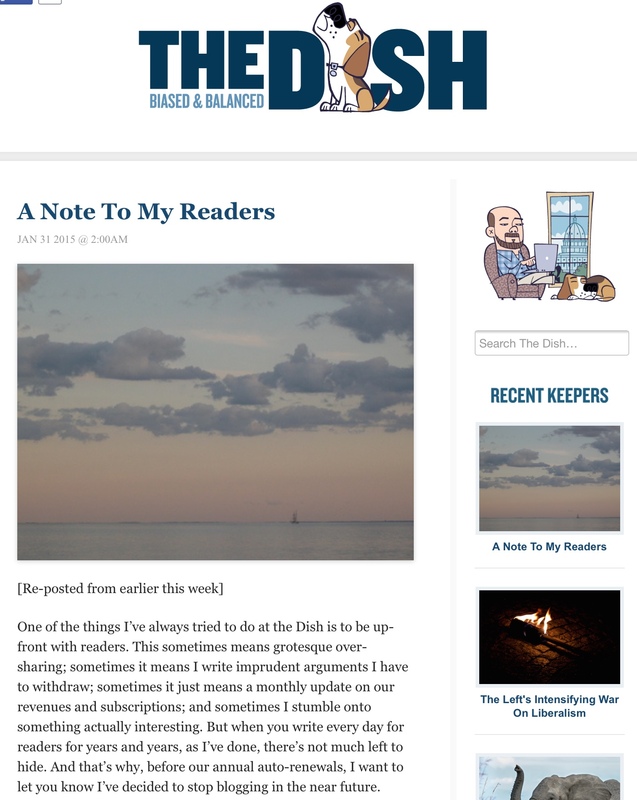 Andrew Sullivan’s note telling readers he plans to stop blogging. Occasionally I wonder whether I blog too much and consider whether I should stop, cut back or change directions. I identified with some of the things that Andrew Sullivan said when announced this week that he will stop blogging. Even as a sideline venture, as my blog has always been, a blog keeps whispering “feed me” in your ear. You read or hear things and start thinking about blogging about them, even if you only actually blog about a small minority of them. If you care about a blog, it becomes demanding or time-consuming. If becomes a big part of your life, and sometimes you need to make changes in your life. I want to read again, slowly, carefully. I want to absorb a difficult book and walk around in my own thoughts with it for a while. I want to have an idea and let it slowly take shape, rather than be instantly blogged. Ezra Klein wrote about how blogging has changed under Vox and other media startups. Josh Benton reviewed Sullivan’s blogging history and importance. Mathew Ingram wrote about the evolution of blogging. Ana Marie Cox analyzed our the evolution of blogging and whether the term even fits any more. Sullivan’s reasons for deciding to stop blogging are deeply personal, related to his health and feelings about how he wants to spend his time and about feeding the beast that a blog can become (he started charging for The Dish two years ago, which no doubt raises the pressure for feeding the beast; my blog is free). Each blogger’s situation is different by many factors: what you have to say; your relationship with the people who respond to your blog; how unique or important you think a particular post may be; how frequently you want or need to blog; whether you blog for pay, passion or both; whether and how the blog is advancing your career; other things going on with your life, such as jobs, health and family. Since I’ve made a big deal lately about why editors and newsrooms need to use Twitter, maybe this is a good time to criticize Twitter. It might bolster my position that I don’t see Twitter use as a “rule for entry” for any journalism priesthood. Twitter can be annoying as hell. But so is dealing with sources trying to spin you. Good journalists deal with the necessary annoyances. My frustration with Twitter today deals with embed codes, and if you share my complaint, I will offer a partial solution (if you scroll down or stick with me). As important as I think Twitter is to journalism today, I am repeatedly disappointed with its service to users and the quality of its products. My most-read post ever criticized Twitter’s ceiling of 2,000 accounts you can follow, unless almost as many accounts follow you. Every month thousands of Twitter users find that post by Googling in search of a solution for this frustrating limit (the post got 119 hits yesterday). But Twitter refuses to change the limit or provide an easy way for people who hit the limit to prove their legitimacy and keep following more accounts. Other posts expressing disappointment in other aspects of Twitter and the company’s performance are listed at the end of this post. “The tweet is only a tweet if it is a tweet,” says @EricaAmerica of #TwitterHQ display requirements. @ChrisOttoLNP @stevebuttry He definitely lurks on social media. Last Thursday I blogged that editors who want to lead innovation undercut their efforts if they aren’t active on Twitter. 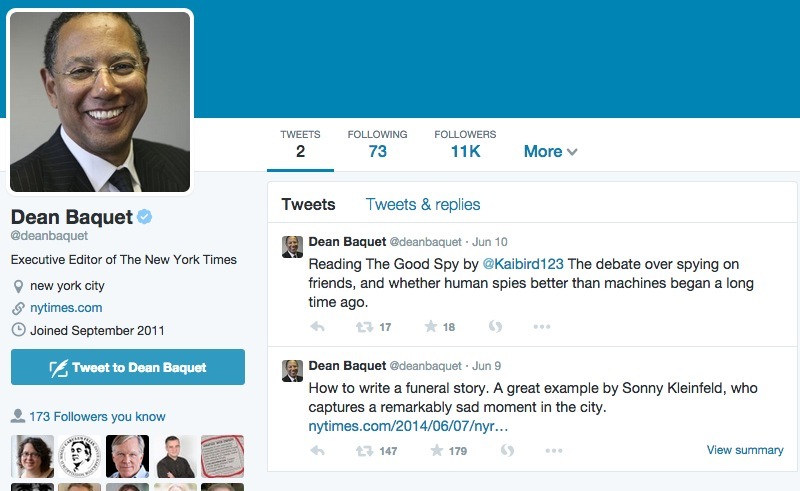 I mentioned Baquet, executive editor of the New York Times, and used the screenshot above (now getting its third run here). So, as I normally do when I criticize someone, I invited response from Baquet. I tweeted at him (not likely to get a response, given the topic of the blog). I also emailed him using the clunky contact form at the Times site. I have no faith in such forms (or in the likelihood that people will respond), so I also asked a friend who works at the times for his email address and emailed him directly. Late yesterday, Baquet responded to my email. This won’t be one of my blogs full of lessons, but here’s one: Email people politely and they often respond. In a later email after I posted his response, Baquet said he responded because “you were fair and persistent.” That combination always serves a journalist well.